Dig a hole 2-3 times as wide and as deep as the plant root ball. Mix Pine Soil Conditioner with original soil in a ratio of about 1:2. 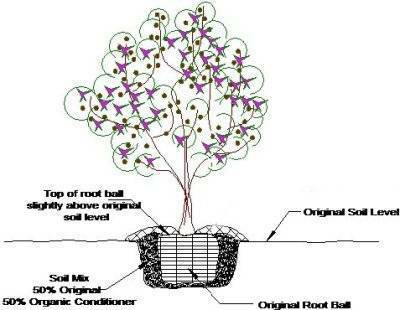 Place the tree in the hole so that the top of the root ball is slightly above ground grade, no deeper. Planting depth is very important. Pull back the burlap slightly from the top of the rootball, & remove any excess soil so that the root flare is exposed. The root flare is the area where you see large roots extending from the main trunk of the tree. Backfill the hole with amended soil and gently tamp. Add fertilizer tablets when hole is ½ full, then fill the hole completely with backfill. Apply a 3″ layer of mulch, taking care to keep mulch away from the trunk. Do not build mulch up around the trunk, instead, form a “donut” with mulch. Apply diluted Biotone Root Stimulator, to give plants an extra boost & prevent transplant shock. Burlap should remain on the root ball to keep it intact. It will bio-degrade in 1-2 months. Take care when handling root balls. A broken root ball is likely to cause plant to die. Removing Root Ball Baskets: Balled & burlap plants may have a metal basket around the root ball which should be removed to prevent root breakage & “girdling” & ultimately may cause the tree or shrub to die. Using wire cutters, snip each vertical wire below middle horizontal rung all the way around basket. Remove bottom portion of the basket, then roll the plant into the hole. Cut the strings on top of the ball & snip each horizontal rung along the same vertical line. Remove remainder of basket. Plants in Containers: These should be planted according to tree & shrub guidelines, but should be planted level with ground grade. No topsoil or backfill should be added above the roots, only mulch which will allow surface roots to breathe. Soil Preparation: For all plants, soil preparation is essential. By taking extra steps to amend soil at planting time & after, you ensure that they will not only survive, but will thrive. Generally, soil preparation means loosening compacted or heavy soils to increase drainage & enrich soil for plants. Particularly in Kentucky, soil needs to be amended for planting. result in rich, loose soil ideal for growing lush, healthy well-rooted plants. Fertilizing: Feeding your plants regularly is a pro-active approach to preventing problems & maintaining plant health. While all plants have different fertilizer needs, these are a few general rules. Refer to our plant-specific information sheets to learn the best fertilizers for your plants. Plants in Containers: Use a slow-release fertilizer such as Osmocote, supplemented weekly with a water-soluble fertilizer, such as Monty’s Joy Juice, Jacks, or Neptune’s Organic Fish Emulsion. Landscape Plantings: Use Osmocote for annuals, perennials, grasses & roses. Supplement this with water-soluble fertilizer. Trees & Shrubs: Use Bio-Tone & fertilizer tablets that feed slowly for the first year when planting. After this, feed woody plants in March, June & November using Holly Tone or Tree Tone. Mulching: Maintaining a 2” mulch layer on beds reduces weeds, maintains moisture & protects plants. Top-dress as needed. Don’t allow mulch to build up on plant stems or trunks & avoid mulching with rock, color-dyed or rubber mulches. Weed Control: Weeds compete with the plants we love. Apply a granular pre-emergent herbicide, such as Preen, to mulched beds every 60-90 days of the growing season. Remove existing weeds by hand or by spot spraying. Stop in our garden center for specific info & products. Trees & shrubs installed following proper planting guidelines, including the use of soil conditioner and fertilizer tablets and watered and cared for properly, are guaranteed for 1 year from the date of purchase. Roses, Perennials, Ornamental Grasses, Fruit Trees, Brambles & Berries are guaranteed to the end of the year in which they were purchased. Services: We’re here to ensure your landscaping & gardening success. As a service to our customers, we want to help you prevent problems & when necessary, identify & diagnose issues. Examine plants regularly & note changes (i.e. discoloration, spots, or loss of leaves, visible pests). Contact us immediately with questions & concerns so that we can help you help your plant. Any plant which has failed to survive should be returned within 30 days of death. Any period of time beyond this makes it difficult or impossible for us to assess the cause of your plant’s failure & does not allow us to avoid the problem from re-occurring. Do not dig up & return plant material until we are sure it is dead. Certain plants may take longer to emerge in spring or recover from trauma. We do not replace plants that are still living. You must have proof of purchase & return the plant to receive credit. This is a purchase value credit & a one-time replacement credit only. Plants will be replaced with the same size or value of original installed materials. We do not issue cash refunds. Shared Warranty Plants: Certain plants require special soil preparation, site selection, may be marginally hardy to zone 6, & have specific care needs which are the responsibility of the customer & over which Wilson’s has no control. We offer a “shared warranty” on these plants to help you along in your gardening endeavors, while recognizing that some plants are difficult by nature or not well-suited to this environment. These plants include: Azaleas, Rhododendrons, Daphne, Dogwoods, Pieris, Japanese Maples, Ilex crenata (Steed, Sky Pencil, Hoogendorn, Helleri, Soft Touch etc. Hollies) Crape Myrtle, Laurels, Leyland Cyprus, Sarcococca and select Magnolia varieties. These plants will carry a 50% shared warranty whereby we replace these items at one time at 50% off their regular price. Sale Items: Items that are discounted by 30-40% will carry a limited 30-day guarantee unless noted otherwise. Warranties on special promotions may vary. All warranties are effective for plants that have been properly planted & maintained. We assume no responsibility for damage by pests, lawn mowers, weed eaters, chemicals, inadequate drainage, soil conditions or neglect. Acts of nature including drought, ice, snow, & excessive wind exempt the warranty. Please be considerate that Wilson’s guarantees living plants whose planting & care in the short and long term is your responsibility.